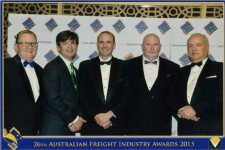 Snapes Project Logistics has been announced runner up at the 2015 Australian Freight Industry Awards, achieving position among the country’s top 3 logistics operators for the most contended award – “Investment in Technology” sponsored by Transport Certification Australia. Close to 700 industry participants, representing all sectors of the Australian intermodal freight and logistics business community, attended the prestigious gala event on the evening of 5th September. Dwarfed by fellow nominees in size, turnover and national footprint, our Melbourne based business has made its mark through commitment to innovation and pursuit of business excellence. Over the past 2 years, Snapes has embarked on a journey of; customising and enhancing off-the-shelf WMS and ERP systems; developing proprietary analytics programs; upgrading security; and outsourcing back-up services. To date, we have spent approximately $1.3 million in this pursuit. Where statistics has pointed 62% of small to medium enterprises experiencing barriers to innovation, where cost is undoubtedly the biggest deterrent; Snapes has certainly overcome great obstacles. We were very honoured to be recognised among industry leaders and peers for our achievements. We are especially fortunate to have our CEO, Rodney Goullet, have such great vision for our company. Nothing would have been made possible without the support of our remarkable team and technology partners who faced the challenges with us.